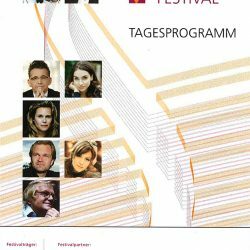 Mark first conducted the Staats Philharmonie Rheinland-Pfalz for two Hoffnung concerts which took place in the Munich Gasteig in September 1999, followed by a repeat performance on 27th February 2000 in the orchestra’s Theater in Pfalzbau. Other concerts followed including an open air family concert, 22nd June, featuring the (Cambridge) Classic Buskers and another with Robby Lakatos and his Hungarian Gypsy Ensemble. At that time the Intendant also managed the Koblenz Orchestra who engaged Mark to conduct the Staats Orchester for their New Year’s Day Concert on 1st January 2003. The orchestra asked for Mark’s return in July 2004 for the ‘Mittel Rhein Musik Festival’ for their Open Air ‘Last Afternoon of the Proms’ concerts in the Bad Salzig Kurpark. The popularity of these concerts has now become a yearly visit for Mark with some repeated performances at other venues. By demand, these concerts are always with the traditional RAH ‘Last Night’ sequence. Various opera singers take part in each concert. Great attention is given to have contrasting programmes each year mainly based around the soloist’s repertoire and style. The concerts are presented regularly by actor (and Moliere expert) Michael Quast. His understanding of British dry and understated humour is very charismatic and gives great joy and merriment to the public. After the initial success in Koblenz, other similar concerts followed: 2004, 2005 Brandenburg State Orchestra, 2006 Luzerner Sinfonieorchester (famous film scores), 2006 SWR Rundfunk Orchestra (Kaiserslauten), 2011 Brandenburger Symphoniker, 2013 Sinfonietta de Lausanne (in the presence of Arthur Honegger’s daughter, Pascale), 2013 Bochumer Symphoniker, 2014 Wuppertal Sinfonie Orchester. In June 1998 the Cologne Radio SO had a similar large open air summer concert in their main square. In June 2007 a special ‘light’ concert was given at the Sage, Gateshead by the Northern Sinfonia to celebrate the life of local entrepreneur, Jack Fawcett, presented by Kate Silverton and Harry Gration. In 2014 Benslow Music appointed Mark as Music Director for their annual ‘Light Music’ 4 day sessions. The following year the brochure read, ‘The charismatic Mark Fitz-Gerald returns in 2015 and brings with him a wealth of expertise.’ Another course for ‘Film and Show’ music has been added for 2016.